McIlroy was unaware of the score in the final round until he walked onto the eighth green, looked at the scoreboard and saw that Tiger Woods, who started the day nine shots behind was now four shots behind tied for fourth place. 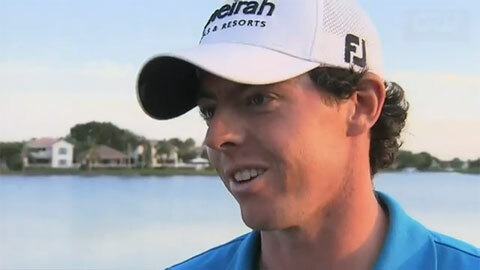 But despite Woods, McILroy went on to win the Honda Classic. McIlroy made an 8-foot birdie putt on the 13th to restore a two-shot cushion. Standing some 65 feet away, in grass so deep he could barely see the golf ball, he gouged out a wedge to 4 feet for a par he badly needed to keep momentum. On the two par 3s over the water, Nos. 15 and 17, he splashed out of a bunker toward the water and saved par both times. The 22-year-old from Northern Ireland finally played it safe at the end, making par on the last hole for a 1-under 69 that was meaningful in so many ways. McIlroy will play the Cadillac Championship this week and then take 3 weeks off before the Masters at Augusta National. PFP Sports and Celebrity Talent Agency assists corporations in booking professional golfers and sports stars for athlete appearances, speaking engagements and endorsements. For Roy McILroy speaker and Roy McILroy booking agent information, call 1.800.966.1380.